“enku paNambUrugu pOyilekAND” (It’s like Enku went to Panambur) is a Tulu saying. Enku is a foolish guy who once went to Panambur for no reason. When anyone is seen going to somewhere for no reason or anyone go to somewhere and return fruitlessly, then people say “enku paNambUrugu pOyilekaAND”. There is a folk story behind this saying which I am going to tell you in Tulu today. I will not translate this story to English/Kannada as I think it will not help you to learn Tulu language. But I will explain the meaning of each word used in the story in English. Read the story completely first and try to understand it in Tulu. If you didn’t understand any of the words, then you can look at meaning in English. Here is the audio file you can listen while reading the story. kUlUruDu dumbori malla sirivante ittegae. Ayeg enku paNpi ori bEledAye itte. Aye bajI pedde. onji dina rAtrae danikulu enkunu lett’d “ellae I paNambUrugu ora pOdu baroDumbae” pand paNper. enku “Avu danikulae” pand paNpe. manadAni kANDae enku bEga lakk’d “dani kODae rAtrae paNambUrugu pOvoDund panter, daniTa paND’d bEga pidaDuvae” pand enn’d danina kOneg pOpe. ANDa dani nanala lakk’dittijer. “dani lakkunenge kAt’NDa portApuNDu, yAn ittene paNamUrugu pOdu bEga batt’NDa danik kushi Avu” pand enn’d paNambUrugu pidaDuve. naDattonde paNambUru muTTa pOpe enku. mulpa dani lakk’d enkunu nADuver. ANDa enku Olla tOjuje. anchene madyAna ApuNDu. paNambUrugu pOtina enku pira barpe. apaga dani Ayen lett’d “indambae enku, I Olitta? ninan ini yAn paNambUrugu pOyerae pantini atambae?” pand kENuver. “yAn kANDene paNambUrugu pOdu battae danikulae” pand enku paNpe. danik sOdyaAND. “anda! I paNabUrugu pOdu dAda malta?” dani keNuver. “Ir dAda malpoDund pantijar danikulae. kAli pOdu bariyerae pantini. ancha yAn paNambUrugu pOdu battae” enku paNpe. unden kEND’d alpa ittina mAterla telipuver. ErANDala kAraNadAntae ODela pONDa att’Da pOyina bElae Avandae pira batt’NDa “enku paNambUrugu pOyileka AND” pand jana paNper. ಕೂಲೂರುಡು ದುಂಬೊರಿ ಮಲ್ಲ ಸಿರಿವಂತೆ ಇತ್ತೆಗೆ್. ಆಯೆಗ್ ಎಂಕು ಪಣ್ಪಿ ಒರಿ ಬೇಲೆದಾಯೆ ಇತ್ತೆ. ಆಯೆ ಬಜೀ ಪೆದ್ದೆ. ಒಂಜಿ ದಿನ ರಾತ್ರೆ್ ದನಿಕುಲು ಎಂಕುನು ಲೆತ್ತ್‌ದ್ "ಎಲ್ಲೆ್ ಈ ಪಣಂಬೂರುಗು ಒರ ಪೋದು ಬರೊಡುಂಬೆ್" ಪಂದ್ ಪಣ್ಪೆರ್. ಎಂಕು "ಆವು ದನಿಕುಲೆ್" ಪಂದ್ ಪಣ್ಪೆ. ಮನದಾನಿ ಕಾಂಡೆ್ ಎಂಕು ಬೇಗ ಲಕ್ಕ್‌ದ್ "ದನಿ ಕೋಡೆ್ ರಾತ್ರೆ್ ಪಣಂಬೂರುಗು ಪೋವೊಡುಂದ್ ಪಂತೆರ್, ದನಿಟ ಪಂಡ್‌ದ್ ಬೇಗ ಪಿದಡುವೆ್" ಪಂದ್ ಎನ್ನ್‌ದ್ ದನಿನ ಕೋನೆಗ್ ಪೋಪೆ.ಆಂಡ ದನಿ ನನಲ ಲಕ್ಕ್‌ದಿತ್ತಿಜೆರ್. "ದನಿ ಲಕ್ಕುನೆಂಗೆ ಕಾತ್‌ಂಡ ಪೊರ್ತಾಪುಂಡು, ಯಾನ್ ಇತ್ತೆನೆ ಪಣಂಬೂರುಗು ಪೋದು ಬೇಗ ಬತ್ತ್ಂಡ ದನಿಕ್ ಕುಶಿ ಆವು" ಪಂದ್ ಎನ್ನ್‌ದ್ ಪಣಂಬೂರುಗು ಪಿದಡುವೆ. ನಡತ್ತೊಂದೆ ಪಣಂಬೂರು ಮುಟ್ಟ ಪೋಪೆ ಎಂಕು. ಮುಲ್ಪ ದನಿ ಲಕ್ಕ್‌ದ್ ಎಂಕುನು ನಾಡುವೆರ್. ಆಂಡ ಎಂಕು ಓಲ್ಲಾ ತೋಜುಜೆ. ಅಂಚೆನೆ ಮದ್ಯಾನ ಆಪುಂಡು. ಪಣಂಬೂರುಗು ಪೋತಿನ ಎಂಕು ಪಿರ ಬರ್ಪೆ. ಅಪಗ ದನಿ ಆಯೆನ್ ಲೆತ್ತ್‌ದ್ "ಇಂದಂಬೆ್ ಎಂಕು ಈ ಓಲಿತ್ತ? ನಿನನ್ ಇನಿ ಯಾನ್ ಪಣಂಬೂರುಗು ಪೋಯೆರೆ್ ಪಂತಿನಿ ಅತಂಬೆ್?" ಪಂದ್ ಕೇಣುವೆರ್. "ಯಾನ್ ಕಾಂಡೆನೆ ಪಣಂಬೂರುಗು ಪೋದು ಬೈದೆ್ ದನಿಕುಲೆ್" ಪಂದ್ ಎಂಕು ಪಣ್ಪೆ. ದನಿಕ್ ಸೋದ್ಯಾಂಡ್. "ಅಂದ! ಈ ಪಣಂಬೂರುಗು ಪೋದು ದಾದ ಮಲ್ತ?" ದನಿ ಕೇಣುವೆರ್. "ಈರ್ ದಾದ ಮಲ್ಪೊಡುಂದ್ ಪಂತಿಜರ್ ದನಿಕುಲೆ್, ಕಾಲಿ ಪೋದು ಬರಿಯೆರೆ್ ಪಂತಿನಿ. ಅಂಚ ಯಾನ್ ಪಣಂಬೂರುಗು ಪೋದು ಬತ್ತೆ್" ಎಂಕು ಪಣ್ಪೆ. ಉಂದೆನ್ ಕೇಂಡ್‌ದ್ ಅಲ್ಪ ಇತ್ತಿನ ಮಾತೆರ್ಲ ತೆಲಿಪುವೆರ್. ಏರಾಂಡಲ ಕಾರಣದಾಂತೆ್ ಓಡೆಲ ಪೋಂಡ ಅತ್ತ್‌ಡ ಪೋಯಿನ ಬೇಲೆ್ ಆವಂದೆ್ ಪಿರ ಬತ್ತ್‌ಂಡ "ಎಂಕು ಪಣಂಬೂರುಗು ಪೋಯಿಲೆಕ ಆಂಡ್" ಪಂದ್ ಜನ ಪಣ್ಪೆರ್. 6. itte = He was; ‘gae’ = Reporting Particle used at the end of a sentence which can be translated as “It is said that”. 21. baroDu = should come (Potential Mood); pOdu baroDu = should go and come; ‘mbae’ suffix used to address people (“mbae’’ is the male form and “de” is female form). 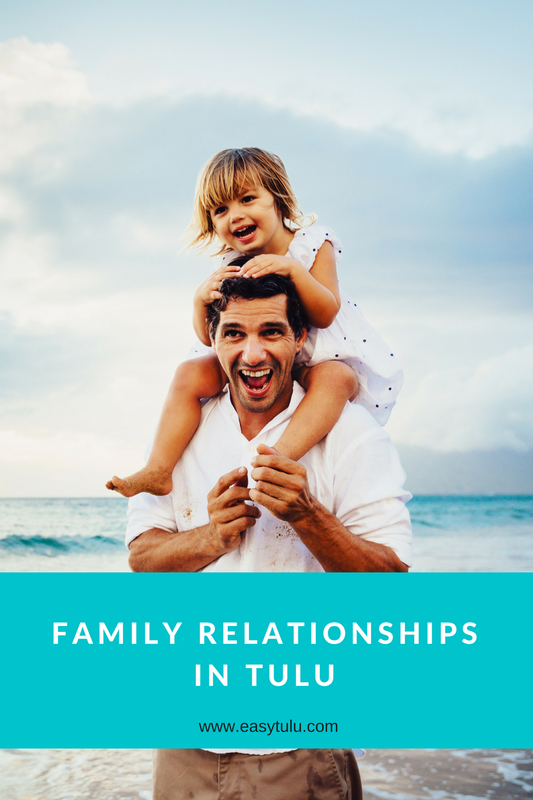 It is extremely informal and can only be used to address close friends, siblings or younger people. 64. Olu = Where; Olitta = Where were you? 72. sOdya = surprise/shock; sOdya+AND =sOdyAND=Got surprised. 73. and = Yes; anda = is it? Particles are uninflected words that don’t exactly belong to another class of words (such as adverbs, etc.) but serve a function within the sentence. 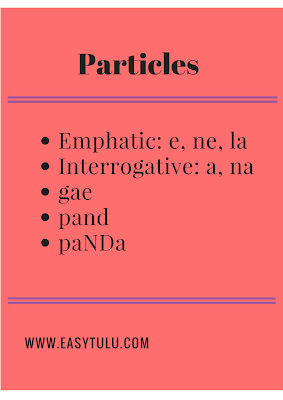 These are emphatic particles used to emphasize a word. This can be translated as “only”, “just”, “merely”, “indeed” etc. ‘ne’ is used after a final vowel ‘a’, ‘e’, 'ae'. ‘e’ is used after a final vowel ‘i’, ‘u’ or a final consonant (or half-u). English: Tree will fall down. ‘These are interrogative particles used in simple questions. ‘e’/‘ne’ are very polite and used to give respect when speaking to elders/strangers. ‘na’ and ‘ne’ are used after a final vowel ‘a’, ‘e’, 'ae'. ‘a’ and ‘e’ are used after a final vowel ‘i’, ‘u’ or a final consonant (or half-u). mara – marana? / marane? - Is it tree? tUka – tUkana? / tUkane? – Let us see? Aye – Ayena? / Ayene? – Is it him? barpe – barpena? / barpene? – Will he come? mOnae – mOnena? / mOnene? – Is it face? sari – sariya? / sariye? – Is it correct? ijji – ijja? / ijje? – No? / Is not there? pOyi – pOya? / pOye? – Let us go? guru – guruva? / guruve? – Is it Guru? uNDu – uNDa? / uNDe? – Is it there? baroDu – baroDa? / baroDe? – Shall I come? kaNN – kaNNa? / kaNNe? – Is it eye? barpar – barpara? / barpare? – Will you come? English: Let us go to movie? Kannada: Is this your house? Tulu: I Epa barpa? iniya, ellena? English: When will you come, today or tomorrow? Kannada: nInu yAvAga bartIya? ivatta, nALeya? English: Can you please do me a favor? English: Shall I come with you? English: Is it raining or not? English: Shall I call them or not? English: Is this good or not? English: Is this true or a lie? Also, these particles are used to change interrogative pronouns into indefinite pronouns and exclamatory expressions. Er – Era – Someone / Wonder who! Erna – Ernana – Someone’s / Wonder whose! enchina – enchinana – Something / Wonder what! dAda – dAdana – Something / Wonder what! dAne – dAnna (dAne + na) – Wonder what! vou – vovva - Something / Wonder which one! Et – Eta – Wonder how much! Epa – Epana – Sometime / Wonder when! Olu – Ola – Somewhere / Wonder where! ODe – Odena – To somewhere / Wonder whither! onchi – onchiya – To somewhere / Wonder whither! Person A: (Wonder who) I don’t know! Person A: Ar Epa barper? Person A: When he/she will come? Person A: avaru yAvAga bartAre? English: They should be here (only) somewhere. ‘dAnna’ is used to express doubt and commonly placed after the word with the interrogative particles. Tulu: Aye illaD ullena dAnna! English: Maybe, he is at home. I am not sure! Kannada: avanu maneyalli iddAno Eno! Tulu: aleg dAda ANDa dAnna! English: I am not sure what happened to her! Kannada: avaLige Enu Ayto Eno! This can be used as a simple adverb in English “too/also” or an emphatic particle which can be translated as “even” or a conjunction “and”. English: I am afraid of dogs. English: I am also afraid of dogs. The English usage of “also/too” is unclear. The sentence ‘I am also afraid of dogs’ could mean “In addition to some other person, I am afraid of dogs” or “I am afraid of dogs in addition to other things”. However, the Tulu sentence is clear; 'la' succeeds the word that it modifies. English: I will come with you too. English: I have not slept for even an hour. English: Is there anyone home? Kannada: namage kuDiyOke sAkashTu nIru ide. This is a reporting particle which can be translated as “It is said”. When reporting something said by others, we normally use ‘gae’ at the end of sentences. Using ‘gae’ at the end of a sentence shows that the sentence you said was not yours, but it was said by someone else or you got the news from unknown source which cannot be believed true completely. English: People say that he is a thief. English: He (or someone else) said that he is waiting for you. 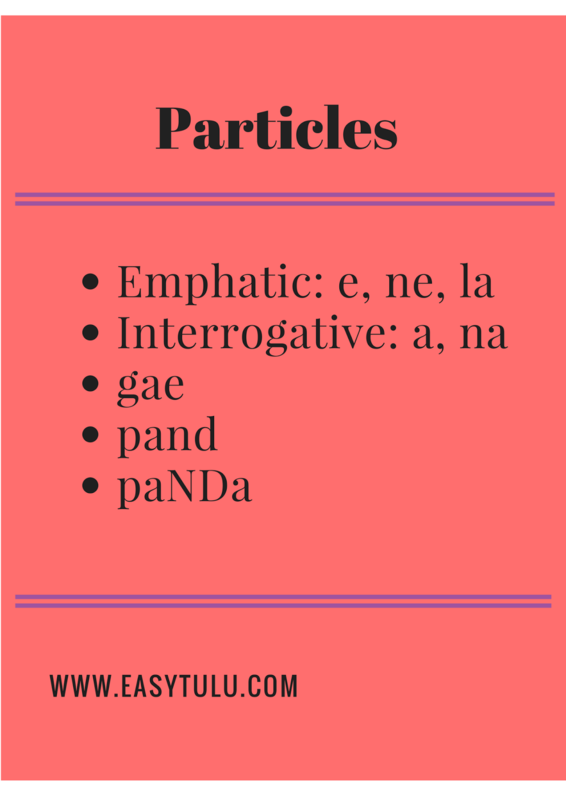 These are not actually particles but past gerunds of verbs ‘paNpini’ (To tell/say) and ‘iNpini’ (To tell/say). Please review the lesson Tulu Lesson 18: Uses of Gerunds(Verbal Adverbs) to know how these gerunds are used. English: He said, "I will not come." English: He said that he would not come. ‘paNDa’ is the subjunctive form of the verb ‘paNpini’ (To tell/say). Tulu: mUlu sharat paNDa Er? English: Who is Sharth here? Kannada: illi sharat andre yAru? Tulu: tuluTu ____ paNDa dAda? 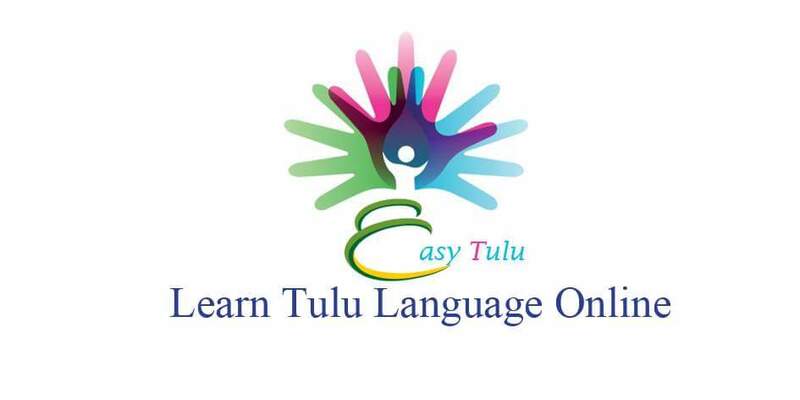 English: What does ____ mean in Tulu? Kannada: tuLuvalli ____ andre Enu? Today let us learn some names of family relationships in Tulu. Here is a list of relationships and their corresponding words in Tulu. 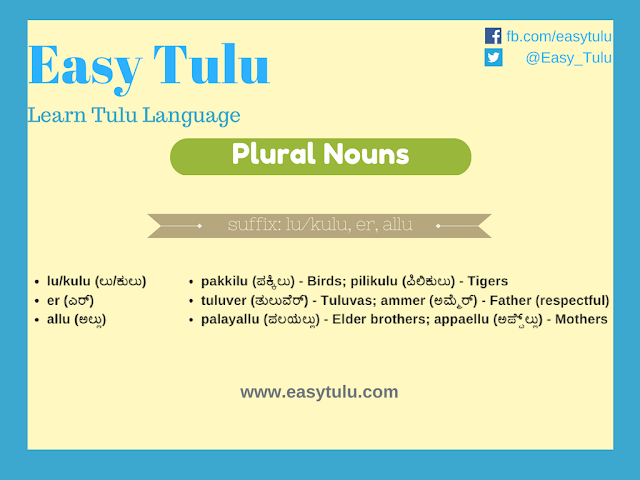 The plural forms of these relation names can be made by adding the suffix ‘allu’ (or aDlu). However, the word ‘bAlae’ is considered as a Neuter noun. So, its plural form is ‘bAlelu’ and not ‘bAleyallu’. Also, to give respect to a single person, we can add the plural suffix ‘er’.